John Cage seems to be everywhere. The Phillips participated in a city-wide centennial event back in September, one of many happening around the world. My Modern and Contemporary Poetry class from Coursera spent some serious time learning about Cage’s chance operations in poetry, generating passionate discussion online between people all over the globe. Our Duncan Phillips lecture by Rick Moody centered on Cage’s composition “4:33″. And yesterday came news that the Museum of Modern Art has acquired “4:33″, the score comprised of “just three folded sheets of almost blank onionskin paper”. If you’ve not experienced Cage’s “4:33″, the clip below demonstrates the fascination and awe over the surprising piece. Continue up the curving stairway to special exhibition Jasper Johns: Variations on a Theme, and you’ll find prints by Johns that share in Cage’s sense of humor. 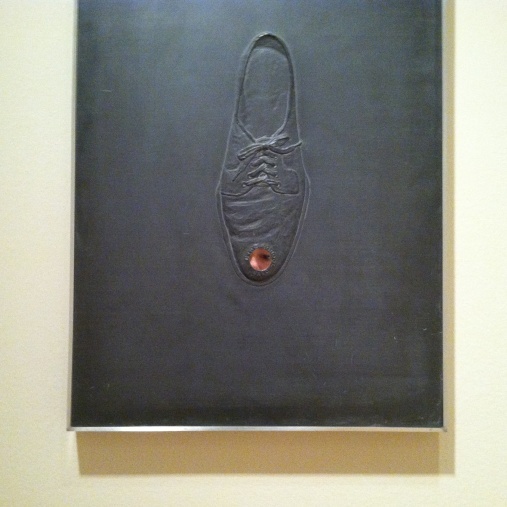 Johns too makes art out of his audience in works like High School Days (1969), a lead embossed shoe of the kind that lends a naughty view when strategically polished and placed beneath a woman’s skirt. Johns has embedded a mirror in the toe so the curious viewer glimpses only his or her own eye. He made this innovative lead relief and others at Los Angeles print publisher Gemini G.E.L. Towards the end of the exhibition look for Ocean (1994), a lithograph of a dancer leaping over abstracted map forms. The dancer is none other than Merce Cunnningham, the avant-garde choreographer who was also a friend to Johns and Cage. 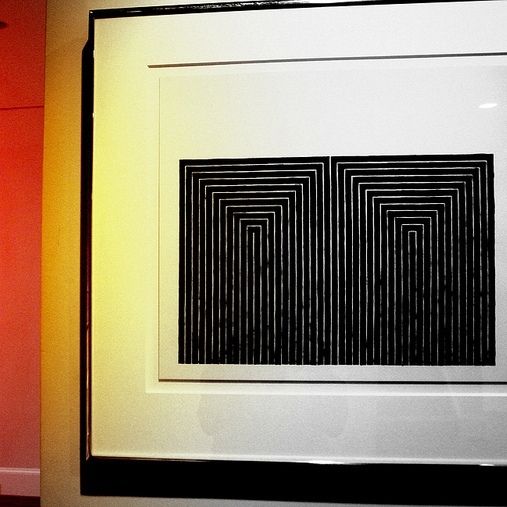 In 1967, Frank Stella designed a set and costumes for a dance piece by Cunningham named Scramble. That same year, he created his first prints and, like Johns, collaborated with Gemini G.E.L. In one print made that year, Marriage of Reason and Squalor, Stella revisited his iconic 1959 black painting. 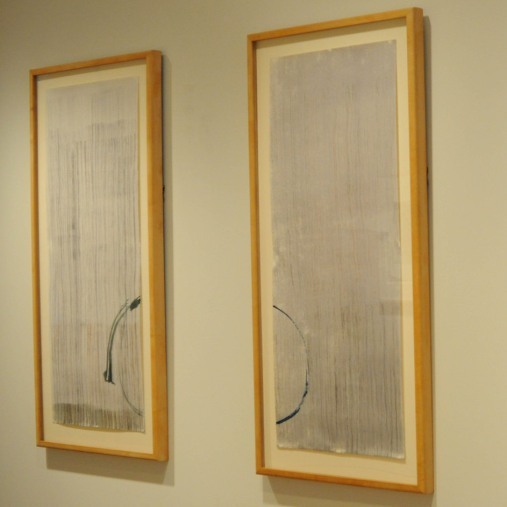 Walk from the Johns exhibition into the original Phillips house, through the Main Gallery, down a few steps, and past the Klees, and you’ll find Stella’s small work on paper, which was gifted to the Phillips in 1991. A luminous glow beckons you beyond Stella’s print, into a gallery with a fireplace, a single bench, and a solitary 60″ x 60″ (but digitally infinite) artwork. 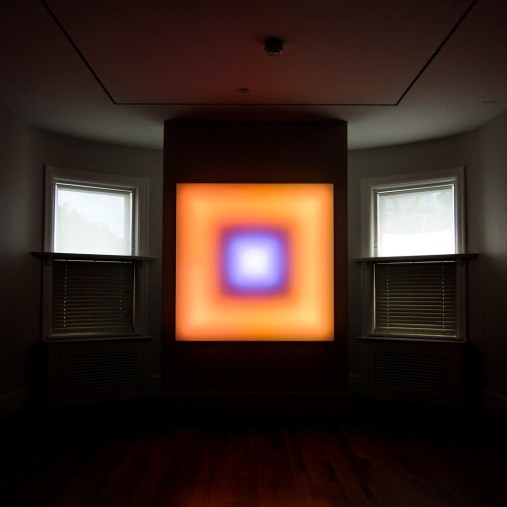 Scramble (2011) is Leo Villareal’s response to a conversation he shared with Frank Stella as part of a panel discussion on Kandinsky at the Phillips the previous year. Sharing a name with Stella’s Cunningham collaboration, this work reminds of motion and dance with LEDs relentlessly shifting (and never repeating) their patterns of color. 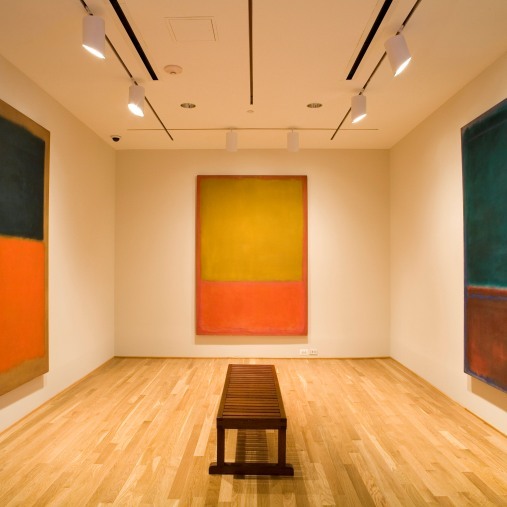 Visitors remark that the contemporary color field is like millions of digital Rothkos. 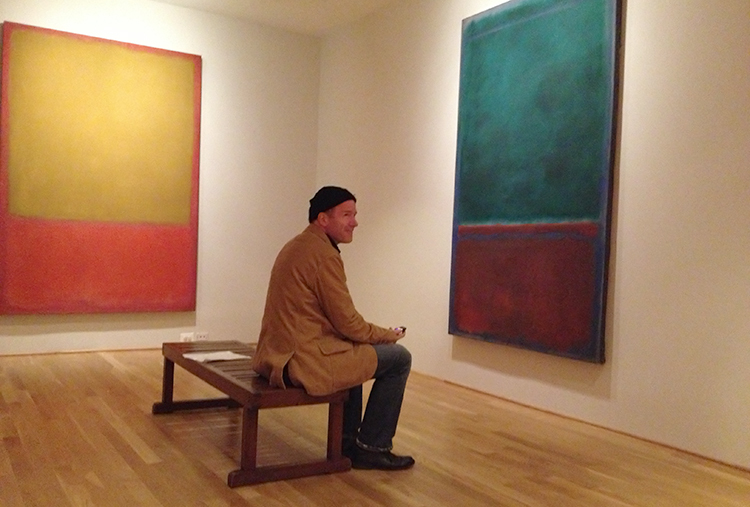 Turn left out of the Rothko Room toward a stairway and red wall. Pause on the landing and look out the window. 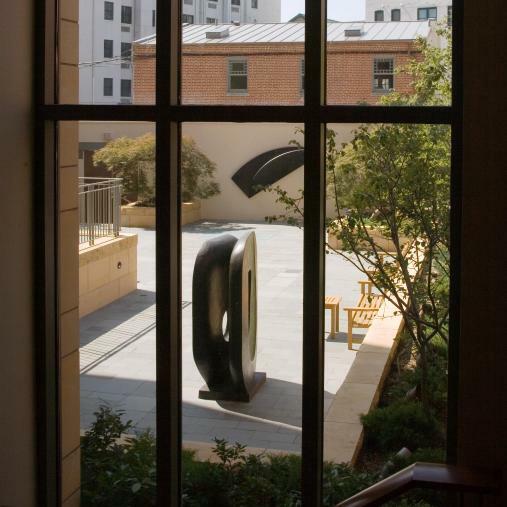 Straight ahead, on the far wall of the courtyard, floats Ellsworth Kelly’s swooping untitled bronze. Villareal’s recent body of work includes a Kelly-inspired piece, Coded Spectrum, in addition to his work in conversation with Stella.